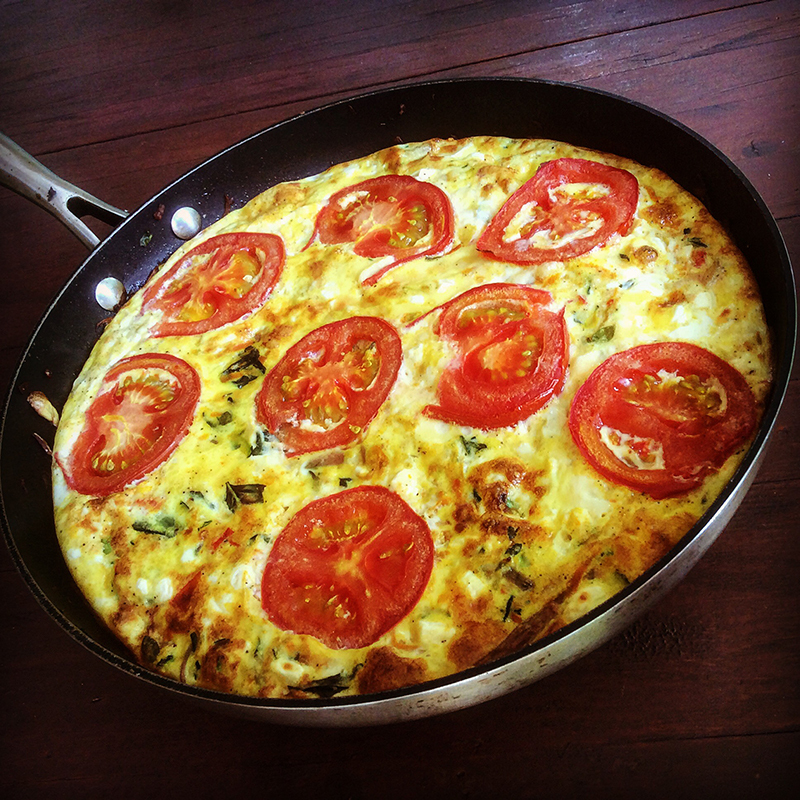 Frittata are a great easy option for breakfast, lunch or dinner. They are easy to make and you can pretty much add anything into them. Here’s a basic recipe but to make it more fancy you can add chopped grilled sweet potato, olives, tofu, chickpea or chicken, the options are endless! Place a large oven safe frypan on medium heat and add the olive oil. Add the onions, ½ teaspoon salt and stir occasionally toasting until just colouring then add the garlic. Cook for 1-2 minutes then add all remaining vegetables except the fresh tomatoes and the herbs. Combine well and stir occasionally. Cook the remaining vegetables until just soft then add the chopped fresh tomatoes, ½ teaspoon salt and the herbs combining well and cooking for a further 1-2 minutes. Meanwhile in a bowl, crack the eggs and add the milk, ½ teaspoon salt and the pepper then beat until combined. Stir in the grated cheese and feta and combine gently. Pour egg mix over the cooked vegetables, poking around a little to evenly disperse the eggs through the vegetables. Place sliced tomatoes evenly over the egg mix. Continue cooking until base of egg mix is cook then transfer the pan into the oven and bake for about 15-18 minutes or until the top is golden. Carefully remove from the oven (using oven mitts on the handle of pan) and serve with a side salad or vegetables.